Other names: Adderwort, Dragonwort, Easter Giant, Easter Ledger, Easter Ledges, Easter Magiant, Easter Man-giant, Gentle Dock, Great Bistort, Passion Dock, Patience Dock, Pink Pokers, Pudding Grass, Pudding Dock, Red Legs, Snake Root, Snakeweed, Water Ledges. 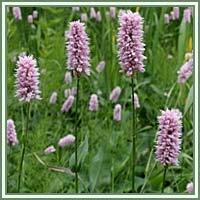 Habitat: Bistort is native to Europe, Asia and North America. It prefers damp soil, including wet meadows and banks of streams. 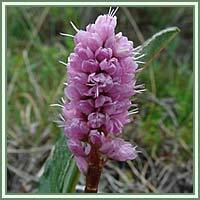 Description: Bistort is a perennial plant. It has tall, slender stems, topped by a cylindrical cluster of small pink-rose to white colored flowers. Bistort is in bloom from May to August. Leaves are produced near the lower end of the flowering stems. They are lanceolate, oblong-ovate or triangular-ovate in shape. They are bluish green, longer near the base, and becoming smaller higher up the stem. Medicinal use: Bistort is considered to be alterative, astringent and diuretic. Traditionally, the plant was extremely beneficial in treatments of diarrhea, dysentery, cholera, leucorrhea, smallpox, measles, pimples, jaundice, ruptures, insect stings and snake bites. Combined with Plantain, it had been used for gonorrhea and as a douche to regulate excessive menstrual flow. It is maybe one of the most powerful astringent plants. Applied directly to the wound, it can easily stop bleeding. Bistort is very helpful in case of both internal and external bleeding. It is also very efficient in case of a nose bleed.